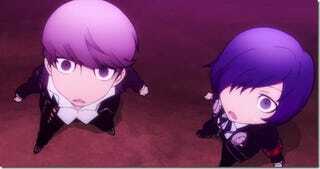 If the player chooses Persona 3 protagonist, the story starts in the middle of a stormy night. Since the school festival is cancelled, SEES gather at Tartarus. They suddenly hear a bell and in a chain of events, they find themselves in Yasogami High School and meet the Investigation Team. If the player chooses Persona 4 protagonist, the story starts at Yasogami High School and after hearing a bell, the Investigation Team are transported to a parallel world similar to their own.